ATTENTION: ASIDE.IO will likely be shutting down on June 1st, 2019 for reasons beyond my control. However, you may be able to help keep ASIDE alive (I am NOT asking for any money). Click here for more information. Thanks for all your support! A free and full featured Salesforce IDE, up in the cloud. Create and edit Apex, Lightning, Visualforce, Static Resources, and Custom Objects. Execute unit tests in multiple ways, view their results, and obtain code coverage. Retrieve or deploy by dropping a package.xml or zip from your computer. Run SOQL queries and view the results in a flexible data grid. Salesforce development is simplified with ASIDE's code editor. Saving is fast, the feel is familiar, and the feature set is robust including autocomplete, organization-wide code search, and on-screen unit test coverage information. Saving code is uber fast and non-blocking, so no more staring at save dialogs. Configure various aspects of the editor including color scheme, invisible characters, and autocomplete. Tired of downloading static resources to modify them? ASIDE lets you navigate and modify files within zipped resources. View code coverage for your entire org, or a subset of it, at the click of a button. Advanced code coverage metrics explain not only coverage by class, but also which classes have the most potential for raising your organization's coverage. Run unit tests in three different ways: all at once, by query, or through individual selection. See tests results in a clear, concise, and filtered format. Understand test failures with the stack trace parser. Run a code coverage report for all, or a set of classes, and share the results with teammates. Pull metadata down from the cloud and push it up with ease. ASIDE remembers the last time you retrieved and deployed, enabling retrieval of all the metadata that has changed since, for straight-forward deploys or commits to source control. Retrieve filters remove the tedium of building package.xml's and reduce chances of forgetting metadata. Have a package.xml to retrieve? A zip to deploy? Dropping the file on ASIDE's push screen will perform the retrieve or deploy. Don't want to use ASIDE to execute your retrieve or deploy? It's also great for generating package.xml files! Administrate your organization's data with ASIDE's query tool. Perform SOQL queries, view their results, modify them, or create new records. Export query results to CSV or share a link to the query results with your colleagues. Execute SOQL queries against all standard objects, custom objects, as well as objects only visible to the Tooling API. View query results in an awesome grid supporting filtering, paging, sorting, and much more. Edit rows and create new ones from within the query result grid. Delete, export, and share query results. ASIDE is full-featured Salesforce IDE built from the ground up for efficient delivery, design, and testing of Apex and Visualforce code. Currently it is not, but possibly in the future. Do I need to give ASIDE my credentials? No, ASIDE never sees your credentials. Clicking the login button will redirect you to the Salesforce.com domain where you can securely authenticate. Does ASIDE store any of my Salesforce or personal data? No, ASIDE does not store any of this information. How can I use source control in conjunction with ASIDE? Since ASIDE does not save copies of your code locally, you will need to perform a retrieve to pull the code out of your Salesforce org. To retrieve the files you will want to commit, while logged into ASIDE click push ⟹ Select Retrieve Filter ⟹ Code Modified By Me Since Last Retrieve ⟹ Add All ⟹ retrieve. This will retrieve (download) all the code you have modified since the last time you performed a retrieve from ASIDE. When the retrieve completes, expand the resulting zip file and commit the code to source control as you normally would. I try to login with ASIDE, but receive the error,"ip restricted or invalid login hours", can I still use ASIDE? If your organization has IP restrictions enabled it will not be possible to login in with ASIDE because it has a dynamic IP address. Is there anything I can do if the login is working inconsistently or I am getting kicked out? If you are getting kicked out, or ASIDE is frequently showing the error recovery popup, you may need to disable the "Lock sessions to the IP address from which they originated" security setting found under Security ⟹ Session Settings within your salesforce organization. ASIDE will not work properly while this setting is enabled. I broke ASIDE while modifying it's stylesheet. How can I fix it? 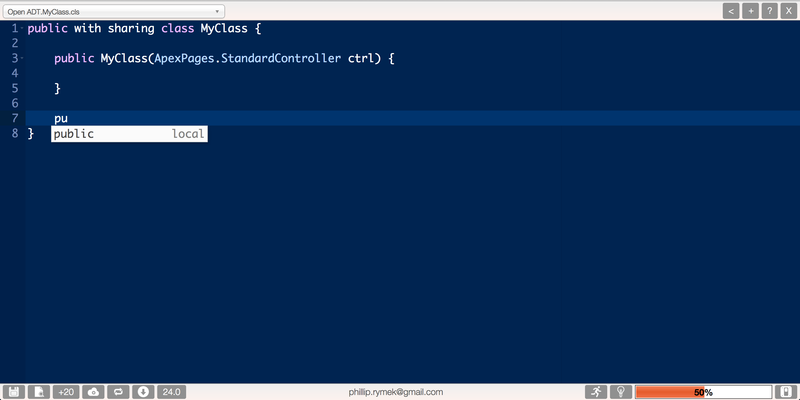 You can reset ASIDE to it's default stylesheet with command + shift + \ on Macs or control + shift + \ on PCs. It's highly recommended that you use Chrome or Firefox while using ASIDE. Safari has known issues related to retrieving and downloading not working properly. Where can I find information about the latest update? Who can I contact about questions/bugs/feature requests? Why and when is ASIDE shutting down?